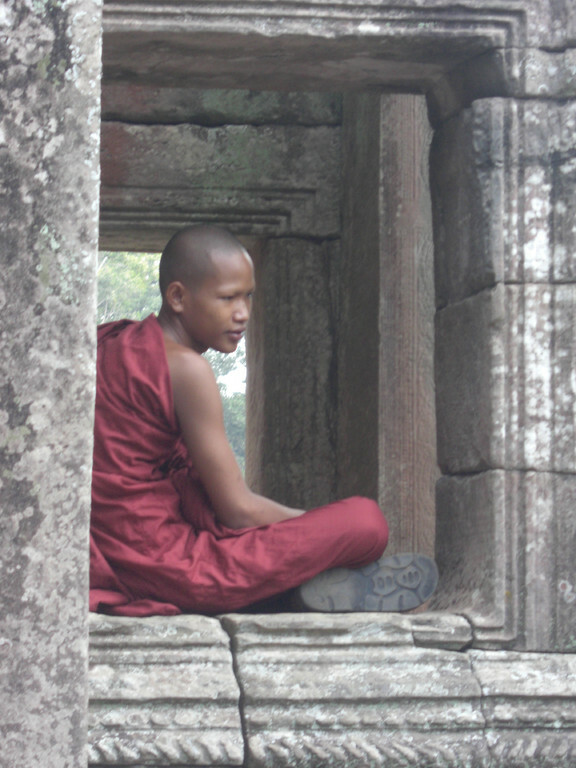 Cambodia : March 3 - 14 : The Temples of Angkor part 3 - wonderpaars jimdo page! When the alarm sounded at 5am, I really wasn’t sure what we had been thinking the night before. But we wanted to see Ta Prohm again and we wanted to see it without the hordes of visiting folks looking for the Angelina tree. Wise enough to know that we were still not feeling ship shape, instead of arranging our regular tuk-tuk driver, we arranged for an air conditioned car to provide transport for today's temples. The longer journey of the late morning would have been almost unbearable with the heat and the dust. We rallied in the dark, met Sokhem outside the Golden Banana and off we went. "Do you have your passes?" he quietly asked. Yes and we were ready to go. And it was worth it. Even Sokhem was impressed and thought about suggesting this early morning trip to future clients. We came across one other couple and their guide, but otherwise the space was empty and peaceful. The light was changing, the birds were beginning to sing and it almost felt like we were exploring uncharted territories. Because we we still feeling very under the water we planned the day with to longer breaks at our hotel room and returned for a 2 hour snooze back to it. The longer journey to Bantay Srei, the women’s temple, located 40 minutes from the other temples of Angkor reminded us that we were in fact not the only ones at Angkor. We had splurged on a driver and air conditioned car instead of open-air tuk tuk, which proved the wisest choice for our ailing bodies. The luxurious mode of travel seemed a bit pretentious considering the environment, but when we actually realized how exhausting the dust and the heat were, we just enjoyed the splurge. Bantay Srei is phenomenal. The carvings are almost unbelievable. The pink color impressive. The intricacy of the designs could keep you fascinated for hours. Today we did not push through the obligatory midday rest, but instead returned to the hotel for lunch and a nap. 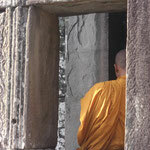 We planned to meet Sokhem again at 3pm for a visit back to Bayon. On the day we first met him, he said that this was his favorite temple and we were intrigued to see what stories he might reveal. But Patrick was feeling worse and would stay at the hotel while I toured the temple alone. If I had felt indulgent this morning, it was even stronger when I climbed into the air conditioned car alone – my own car, driver and guide. Not bad. The stories of the reliefs were the same – the descriptions of the battle, the tales of everyday life including a birth, a death, fighting and feeding. But they way he wove them together and his joy at telling them was revealed every time he pointed to a new relief. The light was changing and at one point the sun emerged from behind the clouds to cast a perfect display onto the genteel faces of the Buddha. 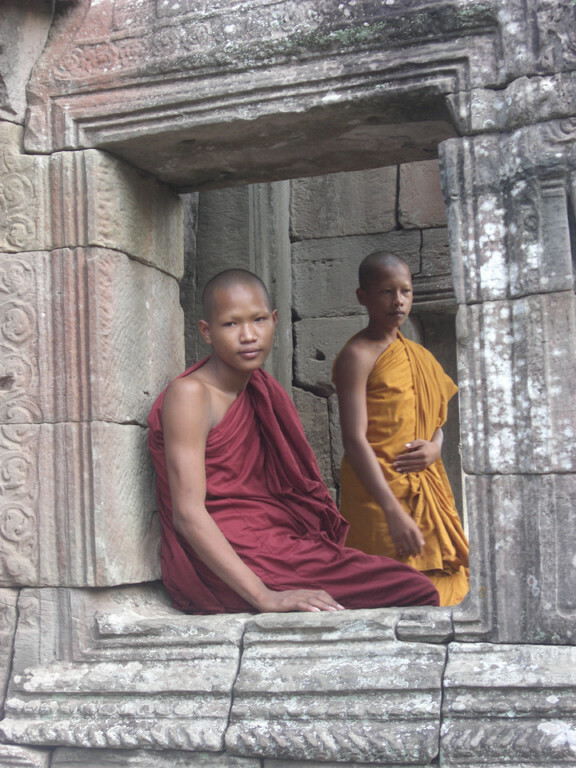 And as I rounded a corner, I stumbled upon two young monks, sitting within the sacred stones of the towers. One was wearing the traditional orange robes, while the other was robed in deep maroon. And naughtily, one was concealing a lit cigarette and a grin. I suppose they have their vices too. And I wanted to take a picture, but felt as though I would be infringing on something so very sacred. Instead I just sat there and watched. Of course when a few other tourists found this gem of a photo opportunity, they had no qualms snapping away, at which point the young monks gave in. I figured this was my chance and with a nod of approval clicked the button. 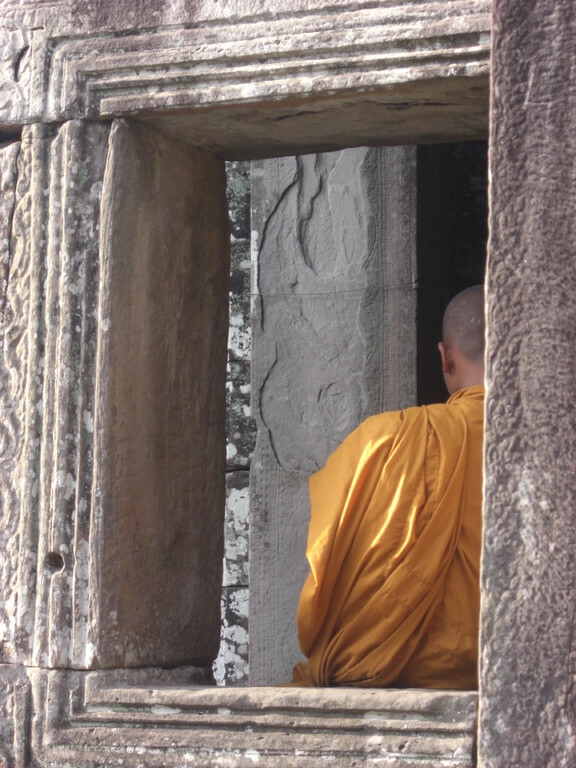 One visitor, with his long lens, 5 pound camera bag and heavy New York accent went too far – actually grabbing the arm of the more modest young monk, trying to get him into the light. It made my stomach turn – this disrespectful behavior – and yet I thought that I was really no different, just in a lesser degree. The clouds covered the sun and the tranquility of the perfect afternoon light was gone. Back at the hotel I thanked Sokhem for an excellent tour of the temples and an even better introduction to Cambodia. He thanked me for Patrick’s questions and lively discussions – he had appreciated the interactions in that they pushed him to think and look for the answers if he did not know them. The feelings of gratitude for our brief relationship were indeed mutual.